Dear Readers, this article was written many years ago and never published, or mentioned in any of our books. With the recent events that Alex Jones has been ‘banned’ by major social media, Apple (AAPL) and others; we felt further analysis was required. As with anything in this world, things are not always as it seems. Here’s the gist of this analysis. The alt-media attacks the establishment on all fronts (and they have ample reason to be attacked). However, logically, this doesn’t make the alt-media right, or protected from some of the flaws they are exposing shown by the Establishment. Remember, that the Establishment is really just well funded, they are people too. There isn’t likely a single individual in the Elite of the Establishment which enjoys to watch human suffering they create with their policies, but as a whole, they act with the subtle and un-agreed agreement of the group-think of the Elite. Plausible Deniability. “We” didn’t do that, we hired some company to do it, and they messed it up. Let us finally point out this is not a personal critique of the person Alex Jones but as he has chosen the path of self-named branding, ‘he’ is the brand of his company and the name behind infowars.com. What he does is respectable and he may very well be putting his life on the line. In this analysis similar to a SWOT analysis, we point out his strengths (He’s an excellent journalist, he has a lot of energy, and isn’t afraid to tell it like it is), weaknesses (presentation of information is unprofessional, he shouts like he’s announcing a boxing match, needs to relax more, doesn’t have a cohesive solution to what he’s presenting), opportunities (he represents a new type of media, not controlled by a central authority, similar to Bitcoin and the Blockchain), and threats (he is clearly a big target, who is being allowed to continue with his operations for various reasons). One last question before the article – why was he using social media? He’s claiming that it’s unfair big social media shut him down, but these companies – most of which are funded by CIA black ops via InQTel, have never been ‘fair’ – and he of all people should know this. Why instead he didn’t create his own social media empire, infowars.network ? Or his own Crypto Currency, InfoCoin? Something really doesn’t add up about this guy, you don’t join facebook and build a following and talk about how facebook is crap and then are surprised when they ban you. 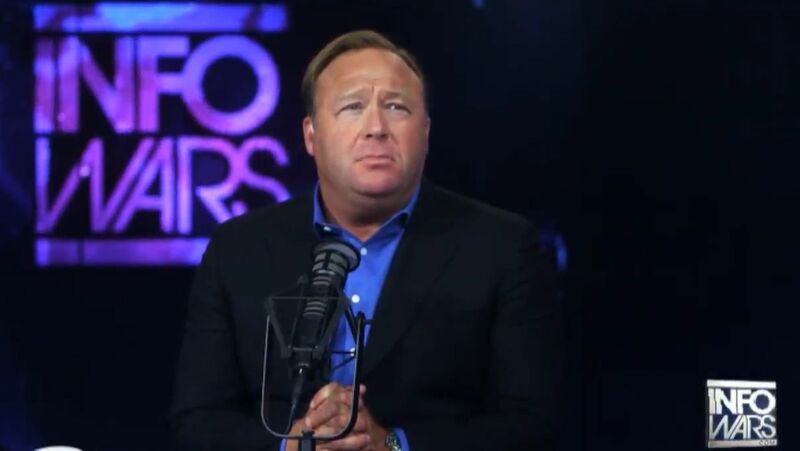 Look, we are huge fans of infowars.com and we love the idea, and support Alex, but he needs to re-evaluate himself and infowars.com if he’s going to achieve long term results. We have our brand Global Intel Hub we invite him to join forces with us. The problem with these big tech firms is they are all controlled by the government. As we have pointed out in many articles, Fakebook is a scam and it’s amazing the stock hasn’t collapsed yet. The only thing keeping Fakebook alive is the military apparatus behind it. To all the lefties, liberals, cry-babies, tree-huggers, and other democrat associated patrons, you are in for a big wake up call. The US Military is the ruling force in the world, not the banks, not the ‘Establishment’ unless you consider the US Military as part of the Establishment. Since World War 2 the USG has ruled with a bigger stick principle. They created the internet! They created Google, Facebook, and other consumer related networks. So Alex Jones is the one who needs to ‘wake up’ unless he is going to probably say he did this only as an example to show this fact to the masses how social media is a tool of Establishment control. The US Dollar, as we explain in our book Splitting Pennies – is backed by bombs, not by ‘faith’. Here is our piece, written 4 years ago and not published, for various reasons but mostly, it seems counterproductive. Some of us have lived through many generations of alt-media, such as Matt Drudge, Jeff Rense, Art Bell, of course culminating with our favorite Zero Hedge (because of the trading and markets focus). And so this is in support of alt media, professional feedback from fellow alters. But the problem is that those who are rational are already capable of finding information for themselves and don’t need Alex to ‘wake them up’. The second group, believe in him the same way they believe in the establishment (or religion), without paying attention to facts. They see him as a messiah the same way voters saw Obama as one. Believers aren’t capable of discerning fact from fiction, they go with their ‘gut’. Those who support Alex would say this is some intellectual low hanging fruit they are recruiting that supports the greater cause. But what kind of attention does it attract? But as wrong as the establishment may be, they have invested billions into forming plans for social programming and societal control. Certainly we don’t want anarchy. But the problem with Alex is that he doesn’t have a plan. He’s not exactly a structured guy and doesn’t profess to be, and he offers no alternative solution. For whatever evils you can credit the CIA with, you can’t say they aren’t professional. Whatever faults the government has they have kept a rowdy uneducated bunch of (insert your adjective) from overthrowing the government. What would Alex propose? If Alex as leader what would he do? How would he respond to this? This is not an establishment excuse, simply, we should bear in mind the realities. Reality 1: Alex is not a scientist, he is a journalist. And he started his career by forming a deal to earn a living. There’s nothing wrong with that! It’s completely commendable and should be encouraged. However we need to bear this in mind as some may akin him to Gandhi or some sort of movement leader. Alex is not a scientist and not an intellectual. He is great at rallying crowds and screaming into a megaphone and radio mic but he never met with advisors and laid out a 10 point plan to fix the system he rails against. Reality 2: With all the CIA’s faults they’ve maintained US dominance in last 50 years, irrespective of if we used Nazi scientists from Paperclip and dirty tricks and assassinations. Americans shouldn’t be hypocritical, we didn’t win a lottery ticket; America rules the world with guns, bombs, and hit-men not because people love our ideals. The US military is the only force that maintains the dominance of the US Dollar and the US economy. Our policy is simply use the US dollar, or buy our products, or we will bomb you. Washington feels that the public can’t handle this reality so they spend billions making horribly produced propaganda movies with Hollywood portraying the US as a bunch of hero cowboys who save the world from poverty. They don’t mention that ‘aid’ we give to Africa that we are ‘sending’ money to foreign countries is actually in the form of ‘loans’ that we use as leverage to get resources when they can’t pay the loans back (see economic hit man, see Bolivia water situation). Before the Iraq war Saddam was going to price oil in Euros. While he was a target already, there are thousands of examples of this policy that DC feels we peons are not capable of handling and they may be right. But it works. Reality 3: The mainstream establishment for whatever reason allows Alex to live. This means his meaning and mantra is irrelevant or supportive of their cause. As Alex points out on his website, if you point out something extremely negative against the establishment,they will kill you. This is all fine but why is Alex alive? We can see hundreds of intellectual and business people who died of weird circumstances not to mention just a few Paul Wellstone, Hunter S Thompson, Matt Simmons, more recently Andrew Breitbart, founder of Reddit Aaron Schwartz, and others.. not to mention John Kennedy, Frank Olsen, and countless others too many to name here, all who have deaths which speaking forensically are not conclusive based on evidence. But Alex is allowed to bash the establishment and expose the wrongs and so on and he has a bullhorn outside of Bilderberg “we are not your slaves” – Obviously he’s either working with them consciously or unwittingly OR what he’s promoting is completely irrelevant to their agenda, OR is some sort of smokescreen for something much deeper. In any event, his life and existence based on circumstances is proof that his views are either wrong, irrelevant, or serve the agenda of the elite. Breitbart, and others with damaging evidence, such as Simmons after the BP gulf spill, were immediately disappeared when it was learned they had damaging information. Alex promulgates a wide variety of information. Are we to believe based on his living that all his information is invalid? Matt Simmons was as those in the Oil community will attest one of the top minds in the field and once he explained what he knew about the BP spill he ended up killing himself in a bathtub. So is all of Alex information invalid, or is he just a puppet for the establishment, or is he irrelevant? (If he want to comment about this he should write about it he’s done enough speaking into megaphone). Reality 4: Alex is not arrested. He was at one point hassled by TSA they let him go. Obviously he is allowed to continue with his deluge of information. Is this a dispute between faction 1 / faction 2? Does some faction want Alex to distribute this information to the public, through the means of prison planet and not conventional sources that they can claim anonymity? Reality 5: There are connections between Tim Leary and the CIA (LSD, etc.) and the flower power movement that empowered a generation that some claim made modern America what it is. If in fact Alex is a CIA shill, consciously or not, it is to the discredit of the planners. The occupy movement of late has been peppered with government spooks including but not limited to unions (mob) rule although maybe not from the start (they came later), just as the Kochs financed the Tea Party after it took footing. Flower power was invigorating and gave the left room to breathe and young unemployed people something to do, and they didn’t pose a threat while they were stoned and high. But what is Alex proposing? If Alex is akin to the new ‘leader’ of the leftovers and outcasts they really need to re-examine their policy. The 60’s movement was highly intellectual that involved business people, academics, scientists, intellectuals, the middle class, and many others, and had a strong basic philosophy. But at this time seeds were planted for a new world based on divide and conquer, based on race war, gender war, gang war, war on dandruff, etc. It’s unclear how Prison Planet can even be called a movement other than it its ability to report facts mainstream media doesn’t report. On the surface, it’s really only Alex point; this is the news you won’t see elsewhere. But where’s the substance? What does he propose? Are his followers a bunch of believers? Smart people can get the same news from other sources without all his screaming and other nonsense so it seems he’s providing a religious service to believers who ‘don’t know the truth’ which is unsettling. Reality 6: Based on the above, they (whoever they are) obviously support Alex and his distribution of information. Gore Vidal is no longer with us. Noam Chomsky is really old – maybe he live for another 30 years (we hope!) but who is the replacement? What intellectual force can write books like Gore Vidal like “Washington DC” and political books like “Dreaming War” and who can stand up to the likes of foes like William Buckley? The obvious answer is no one, but we folk live in this world and will die here one way or another. Currently we have technology that we can preserve nearly anything, but what do we have to preserve when 99% smart people are dead or dying? If there is anyone left with a brain they should at least attempt to forage for what they can. Alex does a great job; but his popularity is largely caused by the intellectual void that has been created by this generational shift. Of course we don’t see Noam screaming through a megaphone at Bilderberg, and I hate to even mention them in the same sentence. But who is taking his place? It would be logical that because Chomsky was a teacher he should have thousands or at least hundreds of students that studied his work and at least cloned him (not that they took the next step of their own creative thinking) but if they do exist they must be living in the woods in a cabin without internet. A problem is where to find information? With internet universities have even published entire course curriculums online for anyone to read. But if you work in the fields of politics, finance, intelligence, and other disciplines that depend on real news events, you depend on news sources for research and information. And more and more normal sources like Reuters don’t provide some really important info. Alex is providing info you can’t get at Reuters or CNN. But he’s no Analyst. Chomsky was great at deep analysis of news based on political situation but bear in mind he was a linguist. It’s similar to decline of Wall St., while traders deal with numbers all day, the recent trend of ‘bankers’ and ‘traders’ are those who are trained in ‘finance’ but not ‘mathematics’ which is really disturbing concept. A niche of ‘quants’ has hired high level mathematicians to calculate formulas for their hedge funds, but this is the anomaly of Wall St. Where are the Chomsky’s of today’s pop culture, intellectual culture? Today, in publications like the Atlantic, or I dare to mention some in DC like CATO, are smart people who are paid to say what corporations tell them. This is great for them, that’s what capitalism is all about, but where is the analysis of the topic? It doesn’t exist. We can’t all be geniuses like Chomsky but if anything he laid out a clear logical outline how to read and analyze the world news and political situation based on language, and no one is doing that! In fact it’s the opposite, now reporters, academics (with very very few exceptions) and others just do what people with money tell them. Again, it’s fine – but if we lose our intelligence because we just get paid to say what someone tells us then our brains will lose their use (use it or lose it) then who will be left to think about anything like fixing our bridges and institutions, let alone more complex challenges? What will stop us from becoming a global society of idiots that “like money” (See Idiocracy) and just act like work Horse for the highest bidder?